On 18-19 November 2013, the SSRC hosted a two-day conference with Yale University at Yale’s Maurice R. Greenberg Conference Center. The conference, which helped launch the SSRC’s new China-Africa Knowledge Project, brought together a small number of leading scholars and graduate students from China, Africa, North America, and Europe to explore questions about the production of knowledge and the theoretical underpinnings of China-Africa scholarship—specifically, how to connect the growing body of work on China’s re-engagement with Africa in the last decade to broader scholarly and policy discourses about the economic, political and cultural dimensions of globalization. The conference kicked off with a panel entitled The Politics of Knowledge, in which researchers located in different geographical and disciplinary locations presented and debated “think pieces” about the international production of knowledge on the evolving relationship between China and Africa. It continued with panels entitled Migration and Diasporas, International Peace and Security, and Trade, Aid, and Development. Each set of panel presentations was followed by a lively discussion and exchange of ideas. A final panel on Theoretical Approaches and China-Africa Scholarshipfurther explored epistemological questions generated by emerging empirical research in this space. 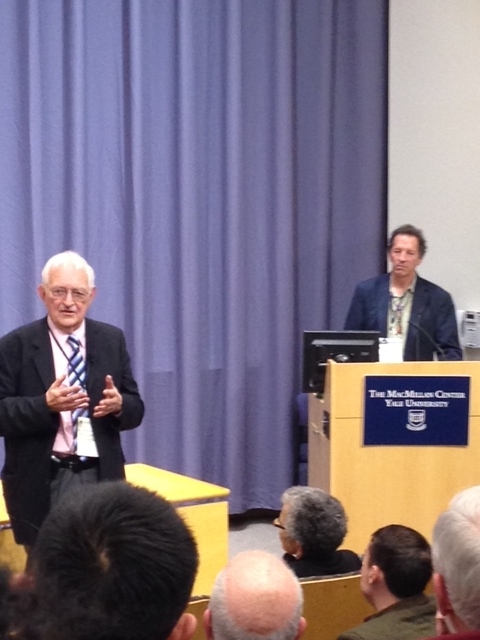 Following the first day of panels, Professor Immanuel Wallerstein of Yale University gave a public lecture in the Henry Luce Hall titled “China, Africa, and the World-System Since 1945.” The hour-long lecture (video below) situated the China-Africa discussion within a wider and changing, global order. The conference was a fruitful and engaging gathering. The discussions that emerged brought new insights to the topic, and even generated some interesting suggestions on research collaborations moving forward. Participants concluded that while the last decade of research on Africa’s engagement with China sought to make sense of a rapidly evolving relationship between a country and a continent, this conference was an important next step in theory-building, and in both deepening and broadening this analysis.